SHENZHEN, China, September 22, 2018 – The world’s most valuable company, Apple, has released the most advanced iOS 12 update for iPhone and iPad on 17th September. It is designed with delightful performance improvements that deliver new fun features to the users. But many iOS users were not sure about the features and how to update their iPhone or iPad to iOS 12 software without any loss of data. 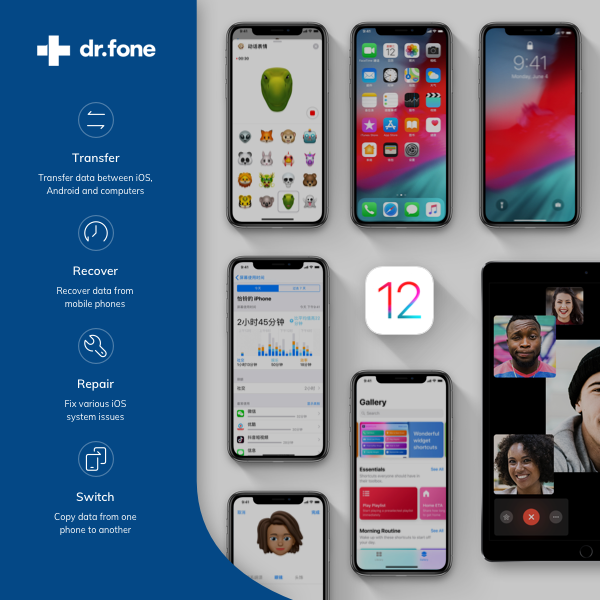 To give more information about this, dr.fone has come out with an ultimate guide to iOS 12 update. dr.fone, is a professional and easy way out to solve mobile problems for both iOS and Android. It comes with a complete solution by WonderShare for various mobile issues like data recovery, backup & restore, transfer and switch, repair, erase, etc. With 10 years of experiences, iOS 12 update guide by dr.fone is very useful for iPhone and iPad users. It is easy to understand and is the most comprehensive. The most essential highlight of dr.fone’s guide is that it ensures zero data loss while updating the most advanced iOS 12 software. “Apple is world’s largest IT Company by revenue. Best known for its quality products, exclusive features and top class user-friendly experience, Apple has recently launched latest iOS 12 update for iPhone and iPad. However, many users are confused about the features of new software update. Also, very conscious about their data, users are not sure how to update their devices with zero data loss. Understanding the concern of data loss insecurity, dr.fone has provided the ultimate guide to iOS 12 update. This guide will help users to update their Apple devices (iPhone and iPad) without worrying about data loss,” says Jerry Chan, Senior PM of WonderShare. dr.fone has provided the ultimate guide to iOS 12 update. This guide will help users to update their Apple devices (iPhone and iPad) without worrying about data loss. The ultimate guide by dr.fone informs iPhone and iPad users about iOS features. It provides different steps on how users check their device compatibility with iOS 12 update. Also the guide comprises backup device processes via dr.fone, iCloud and iTunes that ensure 100% data security and zero data loss. Along with this, dr.fone has mentioned the detail procedure about iOS 12 update and other related information. The contest of Vote and Win dr.fone toolkit has drawn special attention of users. The most amazing thing is that this giveaway is easy to attend, no purchasing requirement, just vote “ios11 VS iOS 12.” iPhone and iPad users just vote for their favorite iOS software update and can win the contest. “Data has become a very important part of our lives and one could not afford losing data. Understanding this fact, we have published an ultimate guide for iOS 12 update that is very helpful for the Apple users who are worried about data loss and data security. Our dr.fone backup solution is specially designed to back up your data without any loss and we ensure complete data security. Not only this, if the users will not like the new software update, they can downgrade the iOS 12 update with dr.fone. And we also offer a data recovery solution if users failed to upgrade to iOS 12. We are also hosting the contest of vote and win that is easy to attend with simple rules,” discusses Jerry, Senior PM of WonderShare. dr.fone’s ultimate guide has provided users with complete information about new AR features, Memoji and fun camera effects, awesome Siri shortcuts and amazing additional features. The most alluring thing which is attracting Apple users is the vote and win contest. The authorities claim to distribute 1-year licenses of dr.fone- iOS toolkit in total. So, it is important to mention here that the value for a 1-year license of dr.fone – iOS Toolkit for Windows is $99.95, and value for a 1-year license of dr.fone – iOS Toolkit for Mac is $139.95. “We are happy with the positive response from iPhone and iPad users about our ultimate guide. Moreover, we are delighted that people are readily participating in the Vote and Win contest. We will announce the results on 10th October and 10 lucky contestants will win 1-year license of dr.fone iOS toolkit,” remarks the Senior PM of WonderShare. WonderShare, a member of the National Planning Software Enterprises of China, is one of the best World class brands. The company has happy customers from 150+ countries. With the slogan “bring simple to life”, it has become a renowned brand. Try the perfect dr.fone iOS (and Android) toolkits that aids to effectively resolve iOS problems with zero data loss ensured.